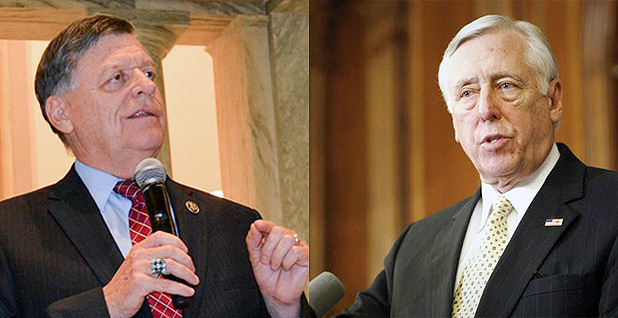 (Left to right) Senior Republican appropriator Rep. Tom Cole (R-Okla.) and House Democratic Whip Steny Hoyer of Maryland are urging bipartisan compromise on spending. Photos courtesy of Cole and Hoyer. House Democrats are warning their Republican counterparts they won't provide them the votes they'll likely need to pass a final fiscal 2017 spending package if it contains contentious riders, border wall funding or deep domestic cuts recently sought by the White House. Minority Whip Steny Hoyer (D-Md.) said yesterday the GOP should be working on a deal that can win the support of both parties to pass the House. But, he said, Republican negotiators have been trying to attach funding for building a U.S.-Mexico border wall that is widely opposed by Democrats. "Of course, they could do that if they could get 218 of their members to support fiscal bills. They have a record of not being able to do that," Hoyer told reporters. The Democrats' warning is the latest wrinkle in Congress' push to have a new spending plan in place when the current stopgap funding bill, known as a continuing resolution, expires on April 28. If lawmakers fail to reach a deal, much of the federal government would be forced to shut down. Republicans increasingly are conceding they'll need the support of Democrats for a broad budget agreement. Rep. Tom Cole (R-Okla.), a senior appropriator with close ties to House leaders, called for his party to work on a bipartisan bill to secure Democratic votes. He said that would likely mean putting off until fiscal 2018 the White House's $3 billion request for border wall spending. "If you can't pass 'repeal and replace' — believe me, you are not passing a spending bill with Republicans only," said Cole, referring to the GOP's stalled health care overhaul. Rep. Bill Flores (R-Texas), a former head of the Republican Study Committee, the House's largest mainstream conservative caucus, said as the majority party the GOP should not have to depend on Democratic votes. But he quickly added, "Democrats are bringing some great ideas, we'll listen to them." House Speaker Paul Ryan (R-Wis.) declined to offer any specifics on negotiations or the shape of the omnibus spending bill yesterday, saying only a final measure would surface by the end of the month — following a two-plus-week recess set to begin Friday. "We're not there yet," added Hoyer, who said about 100 issues remain to be sorted out for the final package, which is lower than the 200 cited by House Minority Leader Nancy Pelosi (D-Calif.) last week. In recent years, the House's most conservative Republicans have regularly opposed most appropriations measures, particularly year-end omnibus bills over spending levels, forcing GOP leaders to rely on Democrats to get them passed. Last year, 68 Democratic votes were needed to get a final fiscal 2016 spending bill through the House. Additionally, 10 Democratic voters were needed last fall to move a temporary funding measure to avoid a federal shutdown. The calculus won't change in the House this Congress with Republicans holding a 21-seat majority, given the five current vacancies awaiting special elections. The hard-line Freedom Caucus, whose conservative members have made a habit of opposing most government funding bills, has more than 40 members, nearly double the number needed to derail any spending accord. Rep. Marcy Kaptur (D-Ohio), the ranking member on the Energy and Water Appropriations Subcommittee, said Democrats would only support a "clean" spending bill devoid of contentious policy riders. Earlier versions of House spending bills have proposed rollbacks of several environmental rules. Like several other Republican and Democratic appropriators, Kaptur said $18 billion in additional spending domestic cuts for the last five months of the year sought by the Trump White House — which would hit U.S. EPA and the Interior and Energy departments, among other agencies — is a "non-starter." Kaptur said agencies have already been affected by operating for most of the year without knowing where final spending will land. "I can't tell you how many complaints I have gotten about [the Energy Department] not being able to contract because they don't know how much money they are going to have. How stupid is that?" she added. Lawmakers from both parties say they want to avoid what would be a politically damaging government shutdown at all costs. But they also acknowledged they might need a CR of at least a few days to avoid a lapse as final details are settled. Leaders in both chambers want to assemble a package that would provide new spending for most if not all government agencies via the 11 remaining fiscal 2017 appropriations bills. Save for the Department of Veterans Affairs and some military programs, most agencies have been forced to operate under fiscal 2016 funding levels since the new fiscal year began Oct. 1. Without new funding by the end of April, agencies could face another CR that would freeze funding at last year's levels for the remaining five months of fiscal 2017. E&E News reported last week the omnibus package is likely to contain a new Energy and Water spending bill, which would provide fresh dollars for the Energy Department and the Army Corps of Engineers. However, it's less certain a new fiscal 2017 Interior and Environment spending bill will materialize, meaning EPA and Interior might face flat funding for the remainder of fiscal 2017 (E&E Daily, March 31).